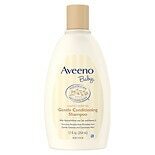 Aveeno Baby Gentle Conditioni...12 oz. 866-4AVEENO. Outside US, dial collect 215-273-8755. www.aveeno.com. Twist off cap and remove quality seal. Do not use if seal is broken. Pour onto a wet washcloth or hand and apply to body or pour directly into bath water. Lather and rinse. 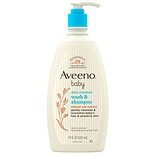 For best results, use AVEENO Baby Soothing Relief Moisturizing Cream after bath.